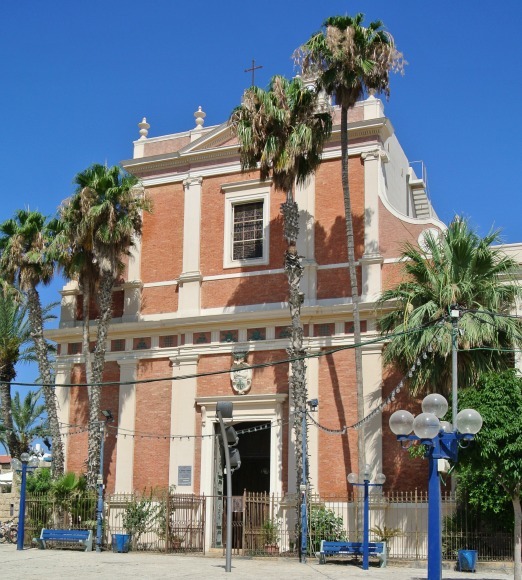 Jaffa is a port in the southern part of Tel Aviv with an incredibly rich history. Some believe it was built by Japheth, one of Noah’s sons, after the great flood. It was later conquered by King David and his son Solomon; cedars from Jaffa were used to build King Solomon’s temple in Jerusalem. The Bible says Jonah set sail from Jaffa before his encounter with the whale, and it is here that St Peter had a vision from God and also raised Tabitha from the dead. And that only takes us into the very beginning of the time we refer to as AD! 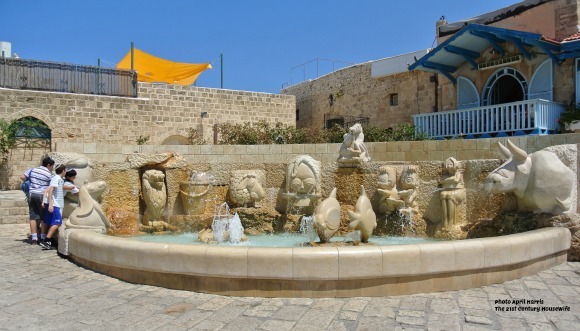 Jaffa is about a twenty-five minute walk along the beach from near the centre of Tel Aviv. To be fair I could normally walk the distance in about fifteen minutes, but it really is very hot indeed, so it takes a bit longer. There are plenty of benches along the route if you feel the need to sit down and the view over the sea is well worth pausing for. 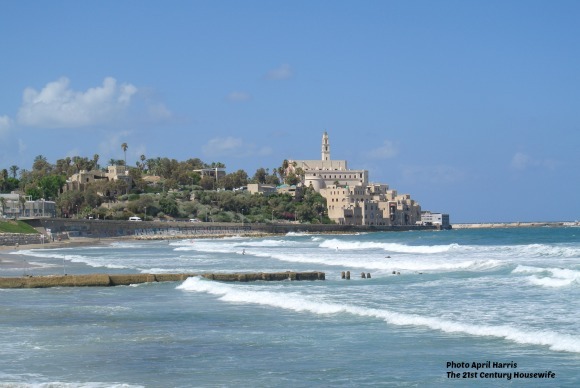 Jaffa is easy to find as the tower is visible from the beach in Tel Aviv. Just head along the beach towards it and you’ll soon be there! 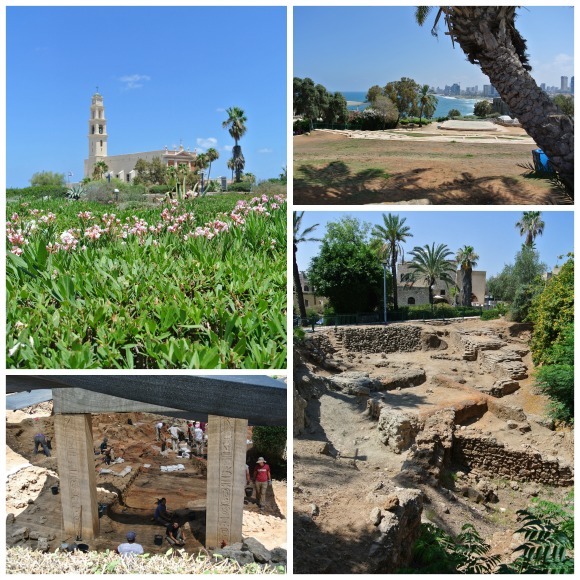 An amazing enclave, Jaffa is a real step back into the past. While the tiny streets near the town square and gardens may be crowded with tour buses, only a few streets back quiet cobbled stair lined streets meander up and down past buildings that have been standing for centuries. There’s something amazing around every corner – like this house, the home of Simon, The Tanner. 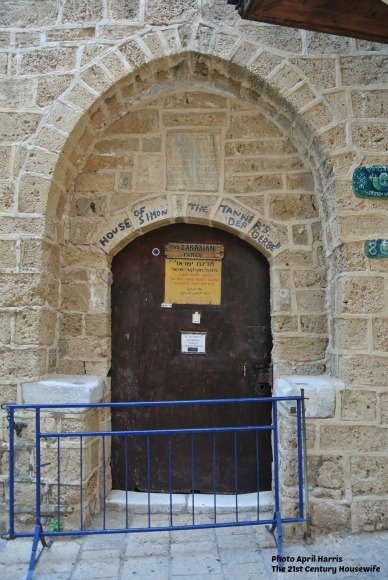 ‘Joppa’ was the latinized form of the name ‘Jaffa’. This is the house where Saint Peter had the vision described in the following verses of Acts 10. 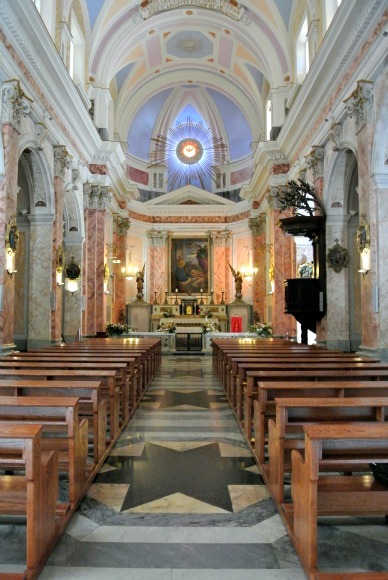 The vision God sent led Saint Peter to include gentiles in the newly founded Christian church. Some sources say that Peter also raised Tabitha from the dead there (Acts 9), others claim it was in a house on the site of the church of St Peter. St Peter’s Church is such a beautiful, profoundly peaceful place. It’s a relatively new building, built in 1894, but there have been churches on this site for over a thousand years. I felt such a sense of awe as I knelt to pray. There are also lots of wonderful, quirky old buildings in the side streets of Jaffa, as well as many shops and galleries. Don’t miss the Zodiac Fountain in the main square, just up from the church. Archaeological excavations under this fountain lend support to the legend of an ancient wishing well on this spot. The legend says that if a person made a wish and cast a coin into the well, the wish would be granted instantaneously. Curiously, there were no coins in the fountain, so I didn’t throw one in to test the legend! If you feel the need for an ice cream at this point (I often do! ), try the Gelateria just across from the fountain. They sell gelato by the scoop in little cups (so no tears when it falls off the cone in the heat). I tried the Hazelnut and Mint flavours and they really were refreshing and delicious. There are also lots of little restaurants and cafes scattered around if you fancy something a little more substantial. If you wander down the steps and across the road (watch out for buses and motorbikes!) you will see public toilets. They were very clean when I visited. Suitably refreshed, you may want to climb the steps next to the conveniences up into the beautiful gardens. There’s a Zodiac Bridge in the gardens, a sister or brother to the fountain, which is also supposed to grant your wishes, but it’s really not very remarkable – just an old iron bridge. Enjoy the sculptures in the garden and climb up to the highest point for a fabulous view of Tel Aviv. Or walk downwards and see two archaeological sites – one a Canaanite temple, one a Egyptian fortress. Archaeologists were actually working in the Egyptian Fortress one of the days I visited. It was incredible watching the ancient buildings being excavated, cleaned and looking almost new in the sunlight. 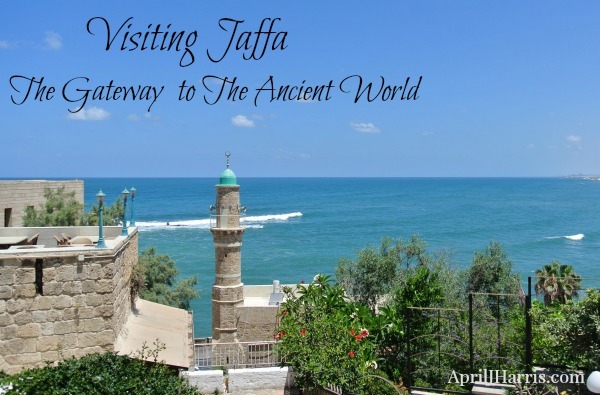 Jaffa is billed as ‘The Gate to the Ancient World’ and it truly is that. Even after several visits, I feel I’ve barely scratched the surface of of this remarkable place and I look forward to exploring it further. If you ever find yourself in Tel Aviv, do take the time to pay a visit to Jaffa. Wow, so much history. Isn’t it wonderful to explore and find places that are more off the beaten path, like the quiet, cobbled stair lined streets? I love seeing the real heart of each place that we visit. You make me want to visit Jaffa. Love your photos. Thank you for sharing on Inspire Me Wednesday. Featuring you in next week’s issue. Thank you for sharing your adventures in Jaffa! So much fun seeing all the photos and learning a little more about the history. I’ve been there a few times myself. I think I had ice cream in the Galleria too! Enjoy! 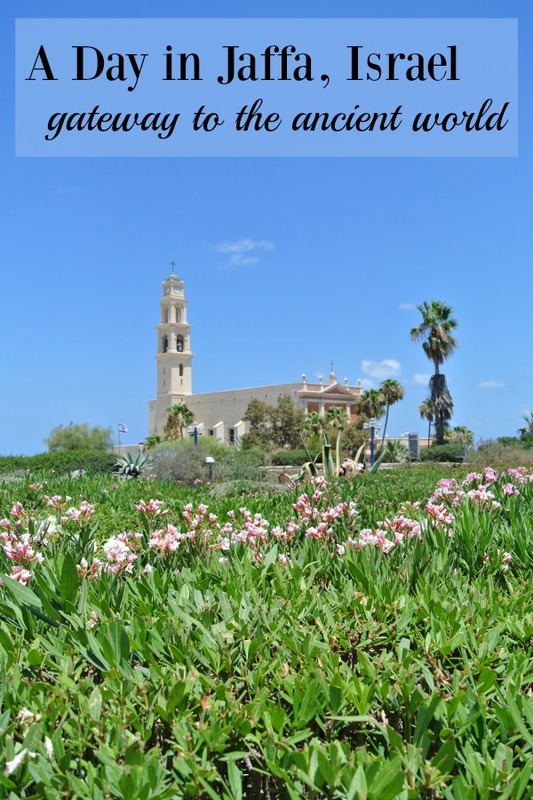 I’m so glad you enjoyed my post, Linda 🙂 I agree, Jaffa really is one of most amazing places I have ever visited! That’s absolutely gorgeous! I would love to visit Jaffa some day! What beautiful architecture! What a beautiful and historic city. I can’t imagine walking through so much rich culture and history and knowing what feet trod the ground before! Thank you so much for sharing, April! I love traveling around the world through friends’ (including blogger friends’) photos and stories. 🙂 My friend Johnna of In Johnna’s Kitchen was in Israel in February and she shared some of the same photos, history, and spots on Facebook, but hasn’t shared them on her blog yet. I’m sure she’ll enjoy re-living her visit through your post (which I will share with her) and enjoying another’s perspective. I’m so glad you enjoyed this Jaffa post, Shirley. I’m still working on a post about our visit to Jerusalem. It was so awesome it’s hard to put it into words! 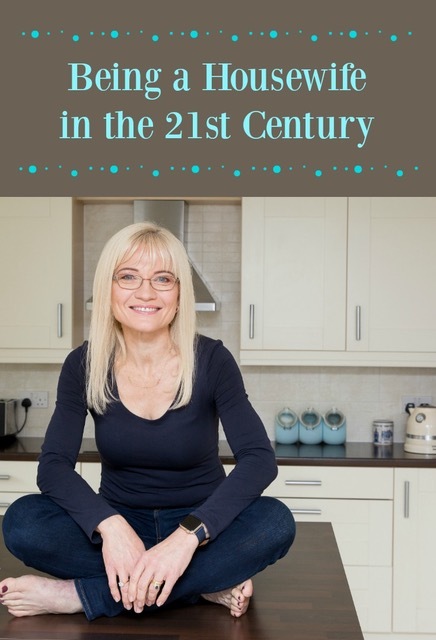 I’ll visit Johnna’s blog – I’d love to see her perspective too! I love the history of the older parts of countries! I haven’t visited Jaffa before but I am putting it on my travel bucket list to visit, looks beautiful. You make me want to go to Jaffa! I love your pictures — especially the one of the church. It really is a wonderful place to visit, Nina! Thank you, I think the church was one of my favourite parts of Jaffa. Wow, what an amazing trip that must have been! I loved just looking through your photos! Thank you so much, Barb. It really was incredible! Wow–what an amazing trip. I’ve never been to Tel Aviv and it sure does look beautiful! 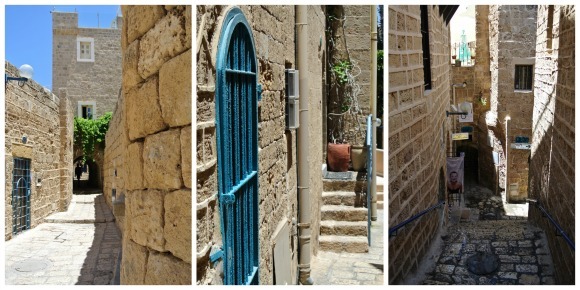 Your photos give a real sense of what Jaffa looks like, I especially love the fountain and doors and streets. Makes it come alive. April, somehow I missed this post — so glad I found it today! Tweeting! Jaffa looks absolutely beautiful and I love that it’s walkable (albeit a hot one!) from Tel Aviv. Thank you for the ice cream tips too! I’m so glad you enjoyed the post, Pauline 🙂 Jaffa is definitely one of my favourite places to visit in Israel! That looks like an amazing area to visit and what a wonderful history to go along with it. Jaffa really is a wonderful place, Joanne. Thank you! I enjoyed reading about Jaffa, April. I have never been before and I would love to explore here. Lovely photos.